Returning from Sydney, Gilbert Goh is shocked by crowded S'pore. "Our government ought to evaluate the social costs of having too many foreigners in our midst. Though the economic benefits may be there, the social cost can be too high for Singapore. " TOC International: Spaced-out in Singapore! I had returned to Singapore from Sydney some weeks back. I was away for only a few months and was shocked at the drastic transformation in Singapore. The first thing that struck me when I reached home was the sheer number of people that I saw on the streets, malls, MRT, buses and even the parks. Meeting people on Sydney’s streets, unlike Singapore, is a premium, especially after dark. In Sydney, I lived a half-hour train ride away from the city. Shops close at 6pm daily except Thursdays, when they close at 9pm. There was one weekend I could not even buy a bottle of soya sauce because the shops had already closed. Parks are also sparsely filled with people. Back in Singapore, I found it difficult to cope with so many people when I am outdoors. I felt giddy at times from the constant stream of people filing in for a bite when I visited Macdonald’s, for example. The cinemas are also full usually and it is tough trying to get a cinema ticket during peak periods and weekends. In Sydney, this is not a problem. Perhaps the AU$15.00 price for a ticket does not make it an attractive item to have for many. They would prefer to rent DVDs at the affordable price of AU$3.00 for one. I did that mostly in Sydney. The Aussies are pretty homely people and most prefer to stay indoors during the weekend. During the summer, many drive to the beach for a swim or to tan. Their incredible love for the outdoors has allowed them to save some precious money for rainy days. I find that Singaporeans tend to indulge in spending too much. We go for movies, dine in restaurants and indulge in post- Christmas sales events. Most of the stuff that we do often have a dollar tag to it. Thinking that I could have some space of my own for a while, I headed to my neighbourhood park one evening as I needed to think through some stuff alone. To my shock, I found that pockets of people had occupied the park. Some were there to smoke and chat whereas others simply sat around. I headed back home, disappointed that I couldn’t have a quiet moment on my own. 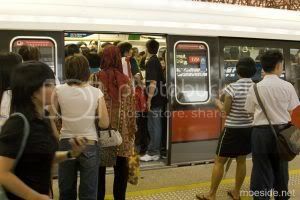 Overcrowding not only restricts one’s movement but also adds to one’s stress as there is a lack of personal space. One often feels frustrated if he has to fight with others for the toilet, movies, dining and, more importantly, jobs. It is not surprising that those friends that I met recently all asked me about the migration experience. Perhaps, they all shared how I feel about the experience back home. They felt like a foreigner in their own homeland. The next thing that hit me hard is the influx of foreigners into our country. Having taken the train several times, I had almost suffocated to death by the oncoming passenger load at every stop. I could smell the stench of human perspiration and also Armani perfume right next to me. Half of the train’s load was also strangely filled with foreigners (e.g. Filipinos, Indians, Chinese, Thais, etc) that I felt like a foreigner in my own country. I felt sad and detached. Am I home or what? In Sydney, the Asians also seemed to dominate. My apartment has 12 units and at least ten units are filled up by Asians – mostly mainland Chinese or Vietnamese. Most Aussies have moved to Brisbane where the houses are cheaper and perhaps they find solace in their own kind. Will Singapore end up like this where the locals move away from the foreigners, creating a deep division? Is this one big reason why Singaporeans emigrate in large droves recently? I ventured to my favourite coffee shop one morning and was shocked to see that the coffee shop was ran mostly by mainland Chinese workers. The worker ratio is three foreigners to one local worker there. They are all young and energetic and could even speak some simple English: “Kopi, want milk or not?” Our elderly workers have never seen so much competition for their often-shunned coffee shop job that pays S$5.00 an hour or less. Once again, I wondered how on earth can MOM allow so many young foreigners to do low-end manual work at the expense of our own workers. Depression soon took over me after that visit to the coffee shop. Our government ought to evaluate the social costs of having too many foreigners in our midst. Though the economic benefits may be there, the social cost can be too high for Singapore. Even in Australia, the Australian government is trying to reduce the emigration quota this year with rising unemployment. Although their protectionist labour policies may seem unfair, there is nothing wrong with the Australian government trying to protect the jobs of their own people. Yet in Singapore, the reverse could be said of ours: the jobs of the foreigners seem more protected than the locals’. This is a shocking revelation. Maybe Australia’s strong social welfare policies have lessened the impact of a financial crisis for individuals and families at large. If one is unemployed, he can claim unemployment benefit. If one is a single parent, she can claim benefit for the children. They need not worry too much about money, unlike us. We only have ourselves to depend on, so much so that it has become an obsession. With that, our lifestyle also largely reflects our status – the car we drive, the house we live in and even the school we send our kids to. Our government has perhaps been too effective in moulding us to be money-making machines. We all know how to make money the moment we graduate or enter the workforce. One takes the highest paying job offer even though our interest is sacrificed here. Bills need to be paid and we rather have cash on hand to buy a new car than doing something that brings us happiness. I may stay in Singapore for a few more months to finish up some tasks. It is never easy for one to adjust to life back home, having enjoyed the nice weather, quiet environment and uncrowded train rides in Sydney. Nevertheless, home is still home especially when I can see old friends and familiar surroundings. I longed to visit friends and catch up over kopi while watching the EPL live games with my kakis. In Sydney, weekends were mostly spent at home with my family watching DVDs and soapy TV programmes. I guess one will not have a perfect place in this world to live his life. More importantly, as we age, we will feel more at home with our loved ones by our side wherever we are. Read also: Is our politics any different from China’s?